Opidum Old Bar is located in the center of Vračar, No 39 Kursulina Street. Opidum Old Bar is one fine place where you can enjoy your first morning coffee or maybe have something to eat. Also, in Opidum Old Bar you can completely relax with the music which guarantees you a pleasant and happy night. Opidum Old Bar has a pleasant ambient and a nice garden and offers you a large assortment of Serbian and foreign drinks, great cocktails,and a pleasant staff, who will always make you feel welcome. The bar has a very interesting ambient, which welcomes about two hundred guests who can spend a really nice time, seven days a week. We have live music performances on Thursdays, Fridays and Saturdays, and we will soon offer them in some other days too. Music which plays until the dawn is a great invitation to stay up in downtown, so, we recommend you to come by to listen to the good music in Opidum Old Bar . An enjoyment in a great choice of reasonably priced drinks is also one of the reasons because of which you will come back again to Opidum Old Bar . Live music performances, carefully selected music and positive energy are the main characteristics of this Bar, and what makes it distinguished within an abundant offer of Belgrade locals. Opidum Old Bar opens at 10 am and it is opened until the dawn. A phenomenal night out is what this bar promises to its guests. You don t need a lot of money in order to have a great fun here, so please bring a good company and enjoy a bohemian night in Opidum Old Bar . 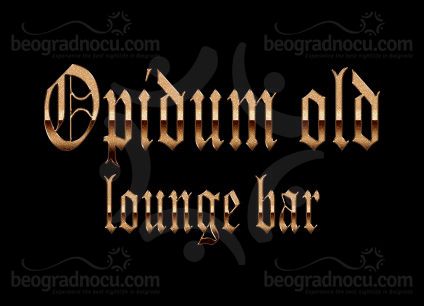 Opidum Old Bar welcomes everybody who knows how to enjoy in a great atmosphere, live music and wide selection of drinks. The pleasant stuff will make you feel relaxed as if you are among old friends. The bar has a wide variety of drinks, such as domestic rakija, wine, draft beer and all kinds of alcoholic beverages, with more than reasonable prices. Opidum Old Bar is a great place for daytime relaxation or nightlife fun, and after the first visit it will become a one of Belgrade locals where you are a regular customer. Whenever you are in a mood for great night out and top atmosphere, this interesting place, located in one of the most beautiful streets in Vračar, will welcome you with the door wide open.